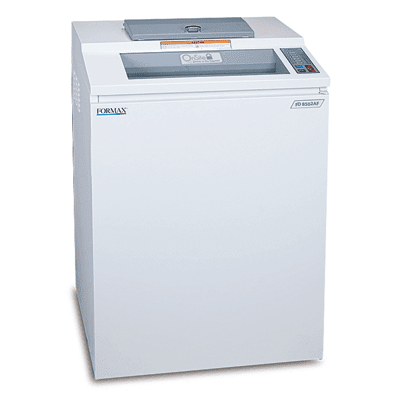 The Formax FD 8502AF AutoFeed Office Shredder features a dedicated AutoFeed Hopper which allows users to load up to 175 sheets, press start and walk away! 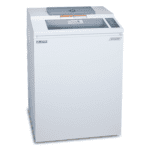 No more standing in front of the shredder, hand-feeding small stacks of paper one after another.The AutoFeeder has a capacity of up to 175 sheets, up to 11” x 17”. The Standard Hand-Feed Hopper accommodates 22-24 sheets at a time, with a 16" wide throat. Key FeaturesAutoFeed up to 175 sheets. LED Control Panel. Up to 11" x 17" paper. All-metal cabinet. 16" feed opening. Energy-saving ECO Mode. Optional oiling system.